Glenn is a lawyer, Nutritional historian, Olympian, author of The Books of Isis series. Born in Toronto, Glenn Bogue attended Villanova University majoring in history and classics. He earned All-American honors both athletically and scholastically, along with an N.C.A.A. post-graduate scholarship. He competed for Canada in the 1976 Olympics and was inducted into the Villanova Hall of Fame. Glenn earned his law degree from Toronto’s Osgoode Hall. While working for the Canadian national track team, he tried to prevent the steroid abuses at the national center in Toronto, and resigned when the anti-doping rules would not be enforced against Ben Johnson, who would be stripped of his gold medal at the 1988 Seoul Olympics for steroid violations. Glenn began studying nutritional alternatives to steroids, and was shocked by the poor level of nutritional education of the very physicians upon whom he relied during his career. His firm stance on proper nutrition for his children resulted in the loss of custody of his five children by the court of Pennsylvania which felt that candy and dairy were “good for the body” His marriage ended in a divorce that the Catholic Church did nothing to prevent, even though divorce is prohibited by the 1993 Catechism of John Paul II. Glenn turned to the scriptures for clues of what he had missed, and came across these startling words ascribed to Jesus Christ: I will not judge you. The one who judged you was Moses. John 5:45 This was diametrically opposed to the Nicene Creed wherein Jesus is supposed to come “to judge the living and the dead” Glenn began to search for the reasons why the church would deliberately obfuscate the words of Jesus. He found those answers in the creation tale of the ancient Sumerians and its history of The Black Madonna. This series of books is the result of that search. What prompted your research into nutrition and/or ancient texts? You claim to possess the greatest secret of all time, forged around a sacred key…please explain. Your work is backed by DNA, so how does this prove your theory? You are the first to connect the Sumerians with The Gospel of John. Explain. How did you come to realize that Jesus Christ was not born in Jerusalem? You have solved the mystery of the Arnolfini portrait. What is background to that painting and proof of your solution. Glenn has been an Olympian who earned numerous NCAA academic awards on his way to earning his Master of Arts in History. He is also an Indigenous lawyer in Canada where the Catholic heirarchy temporarily suspended him for his arguments on behalf of Clan Mothers who know the secrets of his book series, entitled The 5 Books of Isis. 1. The Son of Man and the Creation of Eve and Adam. 3. The Ormus molecule, modern women, and The Stargate. Book I Are you gaining weight? Book II Are you suffering from a disease. Book V Are We Being Lied to? Much of our thinking has been manipulated either by commercial marketing or by religious institutions which often times try to convince you of the truth from their perspective. The tangled web that has been woven is better sent to the dustbin of history so that we can start again on a fresh page. Today the public enjoys the ability to get to a truth themselves by accessing the Internet. We also today have two other sources for delivering the truth: Knowledge of our DNA and The Knowledge of the ancient texts. The Books of Isis represents a Movement of persons willing to seek the truth about BOTH science and the origins of mankind. Our cells were programmed “in the beginning” to produce perfect health. Neither you nor your family should EVER be sick or overweight. Illness rarely if ever is a genetic curse, as if Satan showed up in the womb to foul up your entire lineage. Rather, disease stems from your ignorance about the cells, what they REQUIRE for nourishment, AND WHO FASHIONED THEM! The TRUTH lies with any high school biology teacher. The human cell REQUIRES just 6 nutrients. Today mothers are unable to quickly enunciate these 6 things to feed their children every day; nor can they state the form in which they have to be to be ABSORBED by our cellular structures. How could the world of medicine have become so upside down? This is the probing question guiding this investigation into current thinking about the causes of our diseased states. Countering the proposition that bacteria, viruses and perhaps a poor gene pool are the culprits, the author (who is both a lawyer and an historian) retrieves the concept that the magnificent human body was designed “in the beginning” for perfect health. Listen to “Glenn Bogue on Sacred Matrix with-Sasha and Janet Lessin-2017-02-12” on Spreaker. Jesus the Anunnaki Part I ~ 2018 Christmas Special ~ Sacred Matrix ~ Revolution Radio, Studio B ~ 8 to 10 PM Eastern time ~ Guest Glenn Bogue ~ Hosts Janet Kira Lessin & Dr. Sasha Alex Lessin ~ Producer, Thomas Becker. Jesus the Anunnaki Part II ~ 2018 Holiday Season Special ~ Ascension Center ~ Revolution Radio ~ Studio B ~ 10 PM to 12 Midnight Eastern time ~ Guests Glenn Bogue & TBA ~ Hosts Janet Kira Lessin, Dr. Sasha Alex Lessin, Theresa J. Morris ~ Producer Thomas Becker. ‘Tis that time of year again and with the Christmas season, we once again come together on the Aquarian Radio Network to discuss, debate and celebrate this wonderful holiday season and the reason it exists. We are joined by author Glenn Bogue and invite you and other researchers in the field to contribute and contemplate. Would you like to come on the show and be a part of the discussion? Do you have an article, book, youtube, etc. to share? Are you an author or researcher? Do you have evidence or information? Please email your questions to us at aquarianradio@gmail.com and we may select your question and answer on the air or on our web sites and/or our social network groups and pages. Are you a researcher and would you like to join us on this or other shows in the “We the Anunnaki” series? Is Christ a higher dimensional being who incarnates on many planets to assist the evolution of consciousness? Is Christ a separate being or are all emanations (like Buddha and Krishna) of a higher level soul or Source? What was the purpose of Jesus’s incarnation on Earth? Did he accomplish his purpose? Does he walk among us? Who are the modern incarnations or fractals inhabiting Anunnaki avatars? Are “alive” at this time on Earth? What’s the difference between being alive or being dead? What is the “Halls of Amenti” and where is it? Who’s picture is on the Sphinx? Who rules the planet at this time? Who left after the nuking of Sodom and Gomorrah? Who’s the top of the pyramid, the all seeing eye? Why do the Mormons depict Jesus as a giant? These and many other questions will be addressed in this series. Send your questions to us. If you want to be on one or more of our shows or participate on our panels send your bio, books, youtubes, pics, illustrations. Send to aquarianradio@gmail.com. Jesus the Anunnaki? ~ 12/25/16 ~ Researcher/Author Glenn Bogue ~ Hosts Janet Kira & Dr. Sasha Lessin on Aquarian Radio (www.blogtalkradio.com/aquarianradio) from 6 to 8 PM Eastern time. Is Jesus an Anunnaki? If so, which one is he? Author Glenn Bogue presents his theory that Jesus is actually the Anunnaki Enki and Ninmah is Mary Magdelene. They are alive and well and have walked among us humans for thousands of years and have influenced the course of human history. In this wide-ranging roundtable discussion, leading scholars of the Anunnaki–the Giants from Nibiru who adapted their genome to Earth to make us–and Nibiru (the planet of the Anunnaki) discuss the struggle of Anunnaki factions with which Jesus contended. NEIL FREER relates direct, face-to-face contact he, at age 12, had with ENKI, the Anunnaki who protects and nourishes humanity. JANET KIRA LESSIN, likewise, shares her contact experiences with the Anunnaki. Robert Evans shares photographic proof of planet-sized UFOs deflecting solar flares that Nibiru’s perigee would otherwise wreak havoc on Earth. Shows are archived if you miss the live broadcasts. Nibiru Anunnaki – Jesus Taught Hermetics – Know What Is In Front Of Your Face ! Nibiru Anunnaki – Jesus Taught Hermetics – Know What Is In Front Of Your Face! All Credited To: 5T4RSCREAM233 ,and His Hard Work & Discovery! Surfing the Net one-night last fall, a few days after publication of my latest Atlantis Rising article, “Secrets of the Cathars” (Num. 36, November/December 2002), my pulse suddenly quickened. My article connected the genocide of the Cathars or Pure Ones of Southern France, the secret teachings of Jesus and the supernatural blue stones of the Sumerian creator god Enki or E.A that open stargates and cause enlightenment. Evidence flashed before my eyes that, in addition to Iraq and France, E.A. 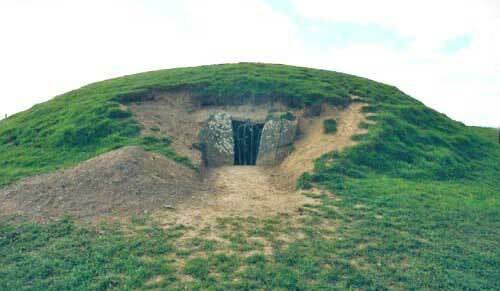 also operated a blue stone-based “stargate mystery school” at the Hill of Tara in Ireland. Conor Newman, an archaeology lecturer at the National University of Ireland at Galway announced that he had located a massive subterranean temple at Tara. Since 1992, Newman has been working on the Hill of Tara preparing a survey of the area for the state-funded Discovery Program. He found the Tara monument using an underground radar device. What they uncovered eventually at the crown of the hill was a huge, oval-shaped monument measuring about 170 meters at its widest point. Around it is 300 postholes measuring two meters wide. Evidence indicates this ‘Crown’ (tiara) jewel of Irish archaeology was constructed through an enormous effort. 300 towering oak posts once surrounded the hill. Newman thinks it probably dates from 2500 to 2300 BC and still had a big physical presence even after the posts were taken out or rotted. While the site is home to many known archaeological treasures, this latest discovery reveals that the real treasure exists underneath the sacred hill and may soon be revived. Newman found the Tara monument using an underground radar device. What they uncovered eventually at the crown of the hill was a huge, oval-shaped monument measuring about 170 meters at its widest point. Around it is 300 postholes measuring two meters wide. Evidence indicates this ‘Crown’ (tiara) jewel of Irish archaeology was constructed through an enormous effort. With its revival will come important new information about Enki. Tara is the prehistoric home of the magical Tuatha Dé Danaan, who are considered to be direct descendants or reincarnations of the biblical Shining Ones (Elohim), the creator gods. W.Y.Evans-Wentz notes that they are described as a race of majestic appearance and marvelous beauty, in form human, yet in nature divine. These treasures were housed in the so-called Cave of Treasures, inside the Mountain of God, where burns a perpetual flame. Tara was considered the Mountain of God, as well as the Illi’s gateway or Ish-Tar Gate to the etheric Otherworld. Passage tombs dot the surrounding countryside. The passage tombs or mounds are called Sidhe (pronounced ‘she’), a pun on the She People or Shining Ones (the She-Ning Ones) who adored Ana, the Great Mother of All Living. From the earliest dawn of Irish mythology Keltic rites were performed here. The mythology of the Danaan indicates they had the ability to control the light of the sun through the power of a magical blue stone of miraculous powers. This stone forms the basis for Irish mythology. I learned, presided over the Tara assembly as the sun god Fin, a Druid in strangely flowered garments, and with a double-pointed headdress and bearing in his hand a book. Fin’s two-headed miter of fishy form (a play on ‘fin’), his upright rod, spotted or checkered garment and basket in hand, are symbols that are easily recognizable in the Sumerian depiction of E.A. presented here. 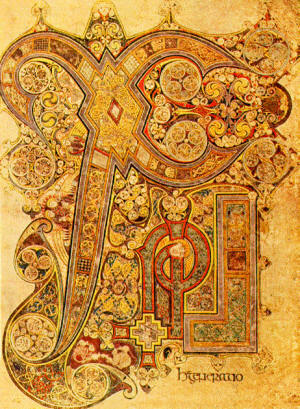 His column (i, eye) or pillar of Tara (‘enlightenment’) is remembered as the Tree of the Wisdom of Life of numerous traditions. E.A. is typified as both the pupil in the eye, with wings and a tail, and as the wisdom-bearing serpent who dwelled within the Tree. 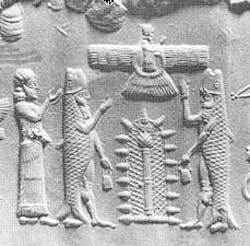 E.A./Enki led the Anunnaki in search of the “blue stones that cause ill,” meaning illumination, luminescence, enlightenment. He found them at a place called Arili (Ireland?). 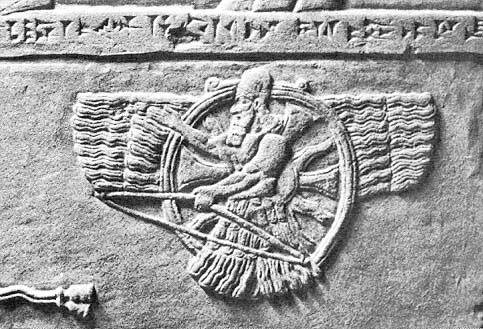 Sumerian myth romanticized by Zecharia Sitchin says Enki was a genetic scientist who came from the mysterious, and presently controversial, Planet X. The blue stones symbolize the exotic ‘missing’ or ‘hidden’ (‘black’) matter of the universe known as the Philosopher’s Stone or the Black Stone. Crystallized into Earth density this black stone shifts its vibration into blue stones (actually tones).The cluster of three orbs symbolize them, just as they do the Word or Life Force of God. When a human places themselves in resonance with the blue stone’s Life Force it transforms them from a human into a god. E.A. founded civilization in ancient Sumeria (modern Iraq). But first, he apparently settled Ireland. As Laurence Gardner notes, Irish mythology of the Anunnaki predates Sumerian civilization by a thousand years or more. Like E.A.’s Sumeria, Ireland comes into history as a full-fledged kingdom, and its sudden origin has perplexed many an historian. Sumerian culture coincides with, the early Irish. It’s as if one culture is the continuation of the other. Both Irish and Iraqi mythology revolve around the secret teachings of the blue stones of E.A. In ancient Irish religion and mythology Tara was the sacred home for the Ari (later the Ari-ish or Irish) who ranked below the Illi gods, yet above the people. Ireland (Ari-Land) takes its name from the Aris or Arians. Ireland is considered the Great Motherland of the Aryan race, otherwise known as Atlantis, Thule or Tula. Aryan or Ari-an is a Sanskrit word meaning ‘noble’. The concept of the Aryan race has been wildly misinterpreted. The root of the misunderstanding is in the Sumerian claim that E.A. and the Pure Lady Ninhursag (Mari) cloned the first model of human as a slave race. Into the blood of a second ‘advanced’ human, the Ari or Illi, they put sacred knowledge. He then separated this new human from the others, taking them to an island home, Poseidon/Atlantis, of which he was the Pa-Tara (father) and founder, the Potei-don or ‘Lord of Wisdom’. His half-brother Enlil, who sought to keep humanity at the level of dim-bulb, Earth-bound slaves, opposed him. Tara is, conceivably, one of E.A.’s laboratories of enlightenment and the place where he brought ‘the Children of Atlantis’, the lost tribe of Enki, after their banishment by Enlil. Irish mythology insists the secrets of E.A. 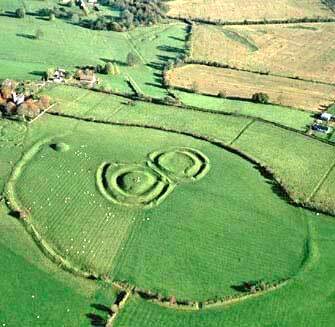 and his lost tribe remain hidden beneath the soil of Tara. The Irish make clear that post-cataclysm Atlantean mythology, including that of the blue stones, originated in Ireland and spread to Sumeria, Egypt and India… and Southern France. Among other uses the blue stones, called Blue Apples in Southern France, were used to open gateways or passages to other realms. Gnostic Christians maintain they were present at the Crucifixion. Afterwards, they were in the possession of the Cathars who were taught the secrets of the blue stones by Jesus. According to Irish belief, E.A. is the root for Iessa, the Holy Spirit, or Jesus. The Dark Age Church stuck out its velvet-wrapped iron fist and attempted to disarm the Cathars of this strange secret fruit. That’s why light burned through my veins as I shuttled between Sumerian, Irish and Cathar histories, pouring over currents of symbols and myths that criss-crossed these cultures. Enlightenment in Ireland, as in Southern France, carried a terrible price. As it would do with the extermination of the Cath-Ari and their Church of Amor or Love (1208-1244), in 1169 the Church of Rome launched a horrifying campaign of terror that shattered the Irish religion and the Mother Church of Tara (‘love’). After English shock troops operating on behalf of Rome conquered this land, which natives called the Skilly or Blessed Isles for having survived the cataclysm of Atlantis, English priests rewrote its history, performing a full-scale perimeter mythic wipe-down of Tara that left it a sunken wreck – physically intact, spiritually destroyed. The Illi were banished to the interior world. The Church of Rome transformed them into devils. As Bruce Rux notes, their stature was considerably shrunk in size, too. This is evidenced by the term henceforth applied to them, fairy folk. 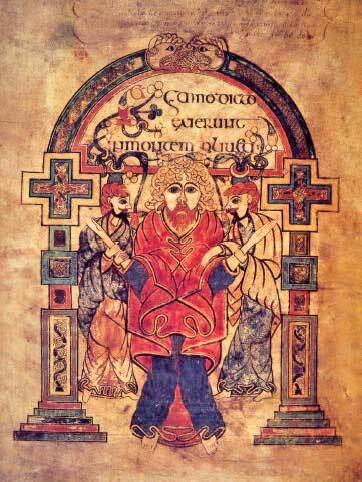 The Tuatha Dé Danaan were described as tall, blond and fair-skinned. By adding a ‘y’ suffix to their name, a demonic or diminutive image was created. 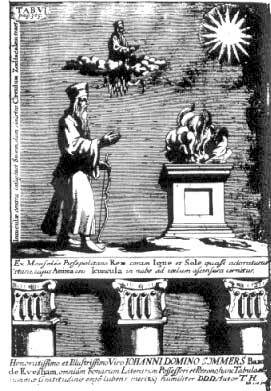 The Church transformed E.A., the Potei-Don (Poseidon in Atlantis) or King of Tara, into Potei, Patti, Patty or Saint Patrick, a Church hero who is probably a fabrication of priests who said that, instead of bringing enlightenment, he came to Tara to confront the ancient religion of the gateway at its most powerful site. 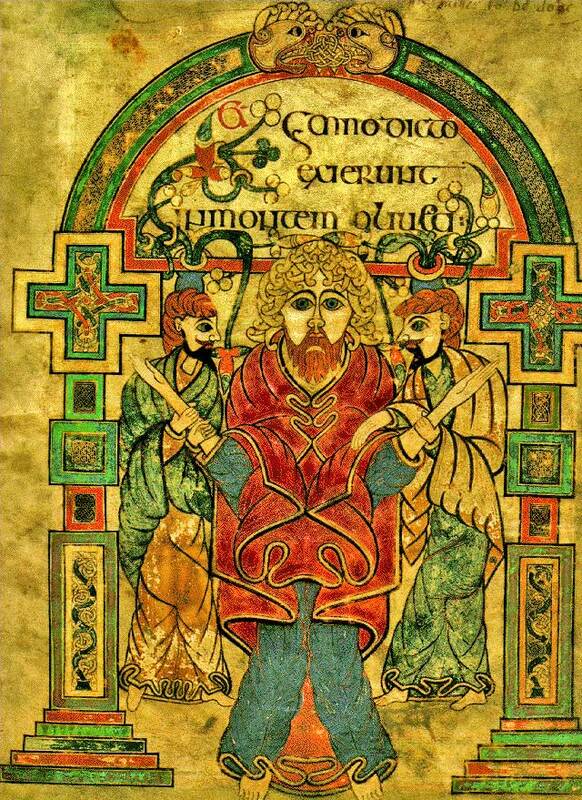 Patrick and his followers prided themselves on burning three hundred volumes of Irish histories and Druidical writings. The destruction of the teaching of E.A. (the King of Tara) has never been completed. The investigations to be made at the Hill of Tara will have far-ranging implications on our understanding of ancient Irish history and the story of E.A. This understanding will enlighten the origins of Hinduism, Judaism, Christianity and Islam, as well. They will reveal their common roots. Today, civilization threatens the temple at Tara. Mr. Newman is concerned about a planned extension of the N3 motorway from Clonee to just north of Kells. One of the sections from Dunshaughlin to Navan runs along the east side of the Hill of Tara. Newman has absolutely no doubt that they will be destroying dozens of monuments connected to Tara (and E.A.). This flickering lantern cannot be allowed to fade. There’s a powerful connection between the blue stones of E.A., Ireland, and the Ark of the Covenant, the golden vessel through which the bright Divine Light presence of God appeared to the Jews. According to Irish lore, the ‘lost’ Ark of the Covenant is hidden at Tara. Early in the 20th century a group of Israelites, connecting tara with Torah, came to Tara with the conviction that the Ark of the Covenant was buried at the famous hill. They dug the Mound of the Synods in search of the Ark but found only some Roman coins. Official excavation in the 1950s revealed the circles of postholes, indicating the construction of substantial buildings here. In several of my books and in the aforementioned AR article, I have deduced that the Anunnaki operated a ‘Tara gate’ at a place called Eschol (translated as ‘stone’). Called the ‘valley of the cluster’ (as in grapes), the Bible locates Eschol in Canaan, the ‘Promised Land’. The Book of Numbers (13) tells us Joshua stole these blue stones, symbolized by a cluster of enormously heavy grapes, from the Anunnaki at the valley of Eschol and returned them to Moses along with a warning, “the land there eateth the people up”. I have interpreted this cryptic phrase as meaning the Anunnaki were operating a gateway that caused people to vanish. The blue stones symbolized this gateway. The Bible is mute concerning what Moses did with the blue stones of the Anunnaki. This is strange considering they potentially represent the core secrets of the universe. These blue stones are believed to be sapphire crystals containing cosmic secrets ‘etched by the hand of God’. Talmudic-Mishraic sources say they were transparent, flexible, blue and, like the grapes of Eschol, very heavy. Graham Hancock mentions these stones in The Sign and the Seal, speculating that Moses knew they were hidden on Mount Sinai and that they are meteorites possessing a supernatural power source. Further, he suggests they are a cipher for the Holy Grail. The cluster of grapes, or blue stones, symbolize the Grail. Most Ark researchers sidestep the blue stones for lack of readily available information, and for the fact that they were smashed by Moses and replaced by a second set of tablets containing the Ten Commandments. An enormous wealth of understanding emerges when we connect the blue stones of E.A. with the Ark of the Covenant. As I wrote in Ark of the Christos, the connection between E.A. and the Ark is easily made. The blue stones were given to Moses by a God of light on the glowing or smoking mountain of light, Sinai, which is considered a metaphor for the Tree of Wisdom and the gate to God. Apart from the Sinai/Tree of Life metaphor, a smoking mountain is either a mountain on fire or a volcano. The god most closely associated with the volcano is the god of alchemy Vulcan or Hephaestus, the gold/soul smith whom the Sumerians called E.A. E.A. 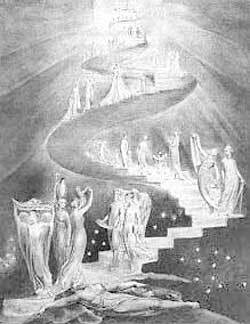 appeared before the Sumerians as the Aryan god Ahura had appeared when seen in his glowing ark on top of Mount Hara, the mountain of Is-Tara, as a being of light. God appeared above the Ark and Mount Sinai in exactly the same way, i.e. in fire and a cloud of vapor and, furthermore, in the form of his ‘Glory’. Priests of E.A., wearing fish suits tend his ipillar. Jesus (called Pan-Tara, ‘god of Tara’) is known in ancient Irish history as Iessa, a name derived from I.A. or E.A. His arrest, shown in the Irish Book of Kells, features the three orbs. Cathar Cross with the serpent (E.A.) spitting the three orbs. The three orbs appear as the triple spiral in Ireland.